This tutorial describes how to use the BMS to create a field plan, and how to create labels that match the plots for the crossing nursery. These labels are suitable for the plot markers and seed harvest packets. Browse to and open the Crossing Nursery from Manage Nursery tool. Once nursery has been saved with germplasm, the measurement tab is populated, and the Actions menu options are activated. The nursery is now ready for field mapping, label making, and planting. Select Make Field Map under Design and planning options from the Actions menu. The BMS uses the term ‘field’ to represent a large planting area which is subdivided into blocks of land each season. 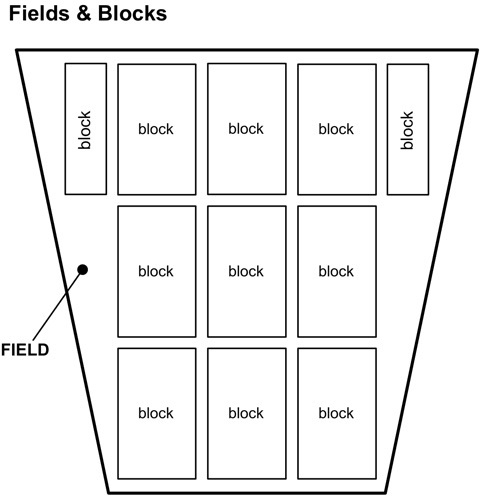 A ‘block’ is part of the field that will be planted in a consistent way for a particular season. (Even if the same part of the field is used in a subsequent season it is treated as a new block). Select field location from dropdown menu. Add field and block names. 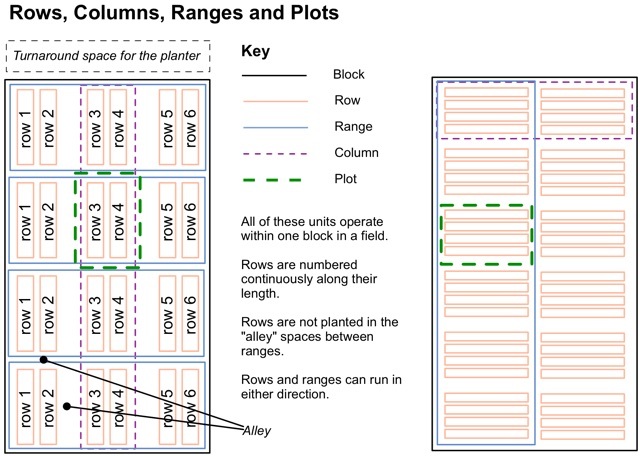 Add 5 rows in the block, 1 row per plot, and 10 ranges in the block. Select Serpentine plot layout order. Accept the default details and select Next. Review the nursery field map and select Finish. The BMS offers nursery-specific information, such as plot # and map coordinates, to include on plot and seed packet labels. Return to the Crossing Nursery. Select Create Planting Labels under Design and planning options from the Actions drop down menu. Choose Formatted PDF Label Sheets From the Output Format option. Drag and drop label text details into the right and left fields of the label. Choose to include the automatically generated bar code (unique plot id). Export Label. Review the .pdf export file. The BMS has limited .pdf label formatting options. If these options do not suit your needs, file types compatible (.csv and .xls) with most label making software are also available for export.